The Disneyland characters are an iconic part of any Disneyland visit. You might even get a photo or two with them, and an autograph with no preparation at all. If you're looking for more from your Disneyland experience, the kind of Disney magic that makes the park so special, these tips will help you get that. Don’t get so hung up on specific characters that you ruin your day. Pick one or two you might like to meet, but also keep in mind that they may not be present the day you're there. Your kid might be the kind who dashes right up to Mickey Mouse and hugs the stuffings out of him—or the one that bursts into tears at the last minute. Be prepared for either. If you want to collect autographs, check out the ideas below and take what you need. You'll save a lot of money compared to buying an autograph book in the park, and have a unique souvenir, too. Take a big, chunky pen. Once you see the oversized gloves some characters wear, you'll understand why that's helpful. Take a look at the ideas below for getting the most out of your character greeting and for cute poses. Take whatever you need for that. With your kids, think of things to say to the characters or to ask them. You can start with the suggestions on the next pages. If your child wants to wear a costume, check the Disneyland dress code. Meeting the characters at Disneyland can be fun. It can also be stressful. Some people complain that their entire trip was ruined because they spent all day trying (and failing) to find that one particular character. Try not to be that person. The easy way to find characters is to look for them as you walk through the park and you can always find characters at fixed meet and greet locations. During celebrations like Lunar New Year and Dia de Muertos, you may find your favorite Disney characters dressed up for the occasion. These meet-and-greets happen in different locations than the characters’ normal photo spots. Check for seasonal events during your visit and click through to find the locations. The most popular characters appear on a pre-published schedule. You can pick one up at the entrance or use the Disneyland app to find out where the characters will be. Unfortunately, it forces you to check each one to find their times and doesn't provide an overall at-a-glance schedule. If you don't have the app and didn't pick up a printed schedule when you arrived, stop at Guest Relations or check with Cast Members at the schedule boards in each park. In contrast to the Disney resorts in Florida, you will also find the characters walking around the California parks, especially around the plaza in front of City Hall. A character is usually on hand for photos just inside the entry gates, too. Characters enter and leave Disneyland through the cast member gate next to the Opera House or the gate near it's a small world. Pay attention when you're in those areas, and you might get a chance to greet them as they pass. You may also encounter Oswald the Lucky Rabbit on Buena Vista Street. And while they aren't official characters, the citizens of Buena Vista Street are fun to see and talk to. In California Adventure, characters enter and leave through a gate near the restrooms in Hollywood Land. Mickey Mouse often enters from there in the morning, just as the park opens. He isn't out for an official character greeting and typically doesn't stop, but he won't ignore a cute little kid (or adult) who says hello, either. Each character of is accompanied by a Cast Member who is called a character host. The character host has two jobs: They take care of the characters and make sure they don't stay out too long. They also manage the lines that form to meet them. For the human-based ones like Mary Poppins, it's easy to get an autograph. Ms. Poppins is what Disney calls a "face character." Face characters talk—and they may seem less intimidating to small children. Characters that wear full costumes (including a head) are called "fuzzies," even if they don't actually have fuzz on them. 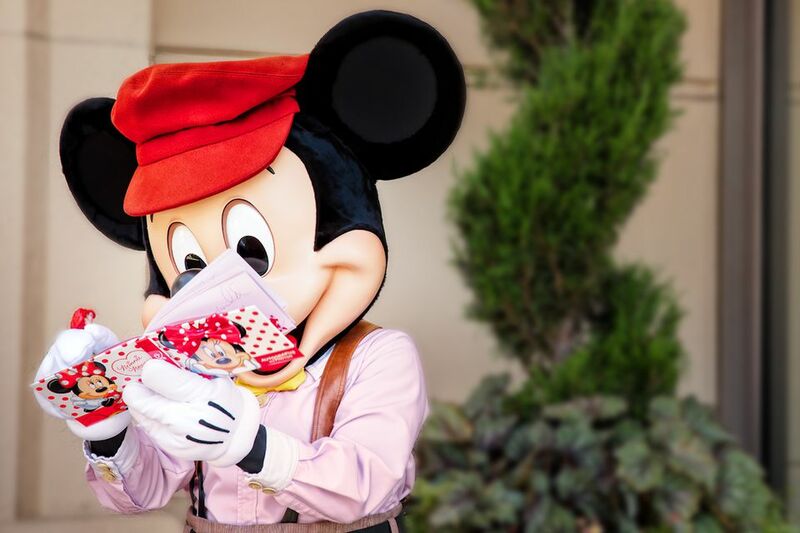 Because of the costumes' construction, the humans inside them have very limited visibility so they hold autograph books very close to their face. Fuzzies also often wear bulky gloves that make it hard to hold a regular ink pen. You can take your own photos of the characters, and the Cast Members are also happy to help out. You might get a good shot, but you'd be surprised how many things can go wrong. People step in front of the lens; weird photo bombers show up in the background, your finger is in the corner. Even worse are lighting issues that make faces come out so dark you can't tell who's who or even worse, equipment trouble. A Disney photographer will usually be on hand at the character greetings. Ask them to take your photo and get a Photo Pass which will give you access to the photo online. You can decide later whether you want to buy it, but otherwise, you pay nothing. Which makes it good insurance against all those disasters. Don't expect a fuzzy character to talk to you. Donald Duck is good at getting his message across (especially when telling you that he's #1) but he can't say it out loud. Don't ask the characters to hold your child. They aren't allowed to. Characters will sign autographs on clothing, but they won’t sign anything you’re wearing. Those fuzzy costumes can weigh almost 50 pounds. On a hot day, the characters spend less time in the park for their own safety. One of a character host's hardest jobs is cutting off the line in time for the character to take a break. It can be disappointing if you get turned away, but you don't want to cost someone their job or cause the real human inside that character suit to get sick. Mind your manners in line. If your child is crying hysterically, take them somewhere else until they calm down. If you need something from a character host, be nice. It will get you more than aggression, demands or screams ever will. If you’re near the end of the line, let others step in front of you until you are at the end. Sometimes, hosts let the last kid in line walk the character to the gate. The average time a guest spends with a Disneyland character is less than one minute, but you can do better. And probably get better photos with them, too. All you have to do is think ahead. Be prepared to meet your character. Hugging them or asking for an autograph is fine, but ordinary. These are some of the things you could do to elevate your character interaction from ho-hum to magical, faster than you can say lickety-split. Write a note (it might just make their day). Take a birthday card. Donald Duck's birthday is June 9; Mickey's is November 18. You can do an online search for others. Bring something unusual. If you ask them to autograph something interesting, you may get to spend extra time with them. Get a free button from City Hall with your child's name on it and face characters may call them by it. Younger kids think that’s magical. Take something to give the character. Some people say that the princesses love chocolate roses. Say a line or two from their movie. Or sing a song. Ask Donald Duck where Mickey is—or ask Donald why he doesn't wear pants. Or how old he is. Bring a picture mat and ask the character to autograph that, then use it to frame your character photo. To turn your autograph book into a scrapbook, get just one autograph per page. Save a blank page across from each one and paste in photos later. Get a copy of the Disney Junior Encyclopedia of Animated Characters and use it to collect your autographs. You can buy them for less than a dollar online. One of the most popular ways to meet and greet the Disneyland characters is at a character meal. You can do that at any of the Disney hotels or in either of the parks. On the plus side, It's a sure fire way to meet some characters, and the meal items can be fun. You don't have to stand in line to meet the characters because they will come to you. The most significant downside is price, which is extraordinarily high if you don't eat much. An adult character breakfast will cost you as much as a dinner entree at a top-rated restaurant. Small children may not like the characters meals because they get overwhelmed by all the noise and people, or they are frightened by the large characters. Don't wait to reserve a character meal until you arrive at the park or you're likely to have a disappointed child on your hands. Call 714-781-3463 to make your reservations or reserve online up to 60 days and at least two weeks in advance. Beware of buying dining vouchers from companies other than Disney which may cost more than list price, while advertising that you’re saving a ton of money. Don’t just think “breakfast” when you think of character dining. Instead, think “meal.” Many of the locations serve lunch or serve breakfast until late afternoon. Instead of taking up time first thing in the morning at a character breakfast, use it as a mid-day break. At any of the meals, the characters will stop by your table. Have cameras and autograph books ready when you sit down. Most (but not all) of the character breakfasts include Mickey Mouse waffles. If that's important to you, check the menus. If you have dietary restrictions, any of the restaurants can work with you to accommodate them. The least expensive of the Disneyland character dining options are inside the parks. Minnie and Friends Breakfast in the Park: Served daily at the Plaza Inn, Breakfast in the Park features Minnie Mouse, who (as the story goes) is taking a break from cutting all those Mickey-shaped waffles by hand. This all-you-can-eat buffet breakfast ends at 11 a.m. It's less expensive than the hotel breakfasts, and it has more characters, including Minnie Mouse. If you want to know what they serve, check their menu. Character meals are all served buffet style. The cast of characters varies by location, as does the menu. You do not have to be a hotel guest to enjoy these meals. Mickey's Tales of Adventure Breakfast Buffet: An all-you-can-eat buffet and menu items are served at Disney's Grand Californian Hotel Storytellers Cafe. It's the most low-key of the character breakfasts. And it's is the ONLY character dining location where you’ll meet Mickey Mouse. If you want to know what they serve, check the menu. Goofy's Kitchen: Goofy's cooking is just as "goofy" as he is. Want pizza for breakfast? No problem, even if you want peanut butter and jelly on it. Other delicacies include macaroni and cheese (for breakfast!) and a buffet full of desserts. Quite a few of Goofy's pals show up, and there's time for some crazy dancing. They serve breakfast and dinner. It's located at the Disneyland Hotel. Donald Duck's Seaside Breakfast: The all-you-can-eat breakfast buffet at the PCH Grill in Disney's Paradise Pier Hotel is one of the best kept Disneyland secrets. Donald Duck and his friends greet guests as the they dine. Check their menu here. It's an expensive way to enjoy a character interaction, but for the right child, it could create the memory of a lifetime. Your little princess will get the royal treatment in a makeover at the Bibbidi Bobbidi Boutique which is near the castle in Disneyland's Fantasyland area. Sign up ahead of time for the full fairy-tale treatment and a Fairy Godmother-in-training will magically transform her into the princess of her dreams. Boys can participate, too turning into gallant young knights with a daring hairstyle, a Prince Philip shield and a sword. If you get the Castle Package, your newly transformed child will be escorted in a mini-processional to the Royal Hall at the Fantasy Faire, to meet and greet their favorite princesses. The best Disneyland character pictures aren't the typical ones. You know the ones where everyone is looking straight at the camera, trying to hold a smile while the photographer counts to three. Instead of being boring, try to capture the interactions you stirred up using the tips on page 4 about how to make the most of your experience. The folks in this photo may be actors, but that isn't the only reason it's cute. Mandy Moore and Zachary Levi posed with Rapunzel and Flynn Rider, the characters they provide the voices for in the animated film 'Tangled,' but they didn't just stand there. Instead, they mimicked the character's poses and stood back to back. Don’t wait until the last minute to get ready to take your photos. Get a PhotoPass from any Disney photographer in the park ahead of time. Get your camera out and get it ready while you're standing in line. Practice taking a photo or two while you're waiting and you may be able to figure out how to avoid those annoying photo fails. Make a #1 sign and bring it out when you take your photo with Donald Duck. Ask the character if you can kiss them or shake their hand. Pluto likes a scratch behind the ears, and Donald loves a kiss on the beak. Don't get carried away with this idea, but think about dressing like the character. At Disneyland, children are classified as adults at a young age, and only those under nine years old are permitted to wear costumes into the park. You don't have to buy an expensive costume, and you can dress with a character theme at any age. Look for clever look-alike ideas on this Pinterest Board.